The name amphibian derives from the Greek word amphibios, which means “living a double life.” Most amphibians spend their early lives in water and then move onto land as adults. Nearly all amphibians share numerous anatomical, physiological, and molecular features. Most are quadrupedal (four-footed), anamniote (no amniotic sac) vertebrates that have glandular skins and utilize cutaneous (skin) respiration in addition to lung and/or gill respiration. Scales, claws, feathers, and hair are absent. Skeletal features include two occipital condyles and no more than one sacral vertebra. Their eggs lack shells, and most species have aquatic larvae that metamorphose into terrestrial adults. The amphibians in Mississippi are frogs and salamanders. Frogs are tailless except as larvae and usually have long hind legs, short front legs, large eyes, and smooth or warty moist skins. Most features defining frogs are skeletal and include nine or fewer presacral vertebrae, presence of a bony urostyle, and fused lower limb elements. The aquatic larvae are called tadpoles. Mississippi has thirty native species of frogs belonging to five families and two introduced species representing a sixth family. The best-known and most exploited amphibian food species in the southern United States is the bullfrog (Lithobates catesbeianus). In southern Mississippi the similar pig frog (Lithobates grylio) is prized for the same reason. While bullfrog hunting has declined in Mississippi in recent years, it remains a popular sport in the Delta, Pearl River, and other areas of the state with swamps and freshwater marshes. Fried frog legs, a particularly southern treat, are served in restaurants throughout the South (although most restaurants serve commercially raised frogs, and the ones imported from other countries may not even be bullfrogs). Mississippi populations of gopher frogs (Lithobates sevosus) have nearly disappeared in recent years and are considered endangered within the state. 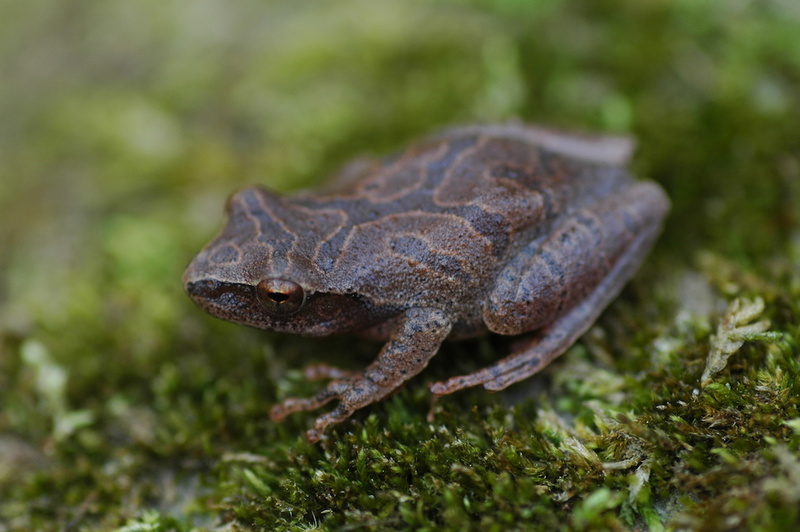 Other frog species—crawfish frogs (Lithobates areolatus), ornate chorus frogs (Pseudacris ornata), mountain chorus frogs (Pseudacris brachyphona), and Gulf Coast toads (Oolotis nebulifer)—are also rare and should have protected status. Some frogs have declined in some areas of the state but not in others. For example, American toads (Anaxyrus americanus) and upland chorus frogs (Pseudacris feriarum) have become considerably less abundant in North Mississippi in recent years. Southern folklore sometimes mentions rains of frogs and toads and claims of toads causing warts. Neither is true. Frogs also do not have a venomous bite. If the skin secretions of some Mississippi frogs come into contact with moist membranes of human nasal passages or mouth, however, repeated sneezing and respiratory discomfort can result. When biologists discuss frog larvae, they frequently refer to the works of Ronald Altig, a professor emeritus at Mississippi State University and a resident of Starkville who is a world-renowned frog authority. He has published more than one hundred papers on amphibians. Salamanders resemble lizards in body shape but have glandular, usually moist, skins and lack scales and claws. Most have four limbs, body trunks with costal grooves, and long tails. Eardrums and middle ear cavities are absent, and many skull bones typical of vertebrates have been lost. Mississippi has thirty species representing seven families. Mississippi populations of green salamanders (Aneides aeneus), spring salamanders (Gyrinophilus porphyriticus), and cave salamanders (Eurycea lucifuga) have endangered status. The tiger salamander (Ambystoma tigrinum) has nearly disappeared in recent years. Other Mississippi species are of special concern because they have limited ranges and habitats that, if altered by human activity, would result in their speedy elimination. These include eastern hellbenders (Cryptobranchus alleganiensis), Catahoula salamanders (Plethodon ainsworthi), and the one-toed amphiuma (Amphiuma pholeter). Bear Creek in extreme northeastern Mississippi harbors a large, grotesque, aquatic salamander that is one of the two bulkiest species in the world. Its unsightly appearance results from its numerous wrinkled and fleshy skin folds. Larger individuals approach thirty inches in total length. This is the eastern hellbender (Cryptobranchus alleghaniensis). Somewhat similar, though smaller and less grotesque, are the aquatic mudpuppies (genus Necturus), the largest of three Mississippi salamander species that reach nearly a foot in total length. Mudpuppies occur in many Mississippi streams. Fisherman catching hellbenders and mudpuppies often call them “devil dogs” or “water dogs” and erroneously believe that they have poisonous bites. The two largest salamanders in the United States can be found in Mississippi. Residents often refer to them as eels or Congo eels, although they are neither from the Congo nor eels. The two-toed amphiuma (Amphiuma means) of southern Mississippi has been known to reach forty-five inches in total length; the three-toed amphiuma (Amphiuma tridactylum) is nearly as long and is found statewide. Both are aquatic with eel-like bodies and four tiny legs. Their bites are painful but not poisonous. Mississippi’s Catahoula salamander (Plethodon ainsworthi) occurs in no other state. The state name identifies the common and scientific names of the Mississippi slimy salamander (Plethodon mississippi). Amphibians are extremely important in food chains necessary for the continuing survival of higher vertebrates, including humans. Nevertheless, many world populations of amphibians appear to be rapidly declining and are believed to be on the verge of extinction.